, a French statesman of great worth and talents, was born at Limoges, Nov. 7, 1668, the son of Henry d’Aguesseau, then intendant of the Limoisin, and afterwards counsellor of state. The family was distinguished for having produced many able magistrates, among whom was Anthony, the grandfather of the chancellor, who was first president of the parliament of Bourdeaux. Henry-Francis, the subject of the present article, was educated under his father in every species of knowledge which promised to qualify him for the office of magistrate. After being admitted, in 1690, an advocate, he became, a few months after, advocate-general of the parliament of Paris, at the age of only twenty-two years. | The king, in appointing one so young to an office of very great consequence, was guided solely by the recommendation of his father. “I know him,” said his majesty, “to be incapable of deceiving me, even in the case of his own son;” and the young advocate completely justified the confidence reposed in him. The celebrated Denis Talon, who had obtained great reputation in the same office, declared that he should have been willing to conclude his career as that young man had begun his. 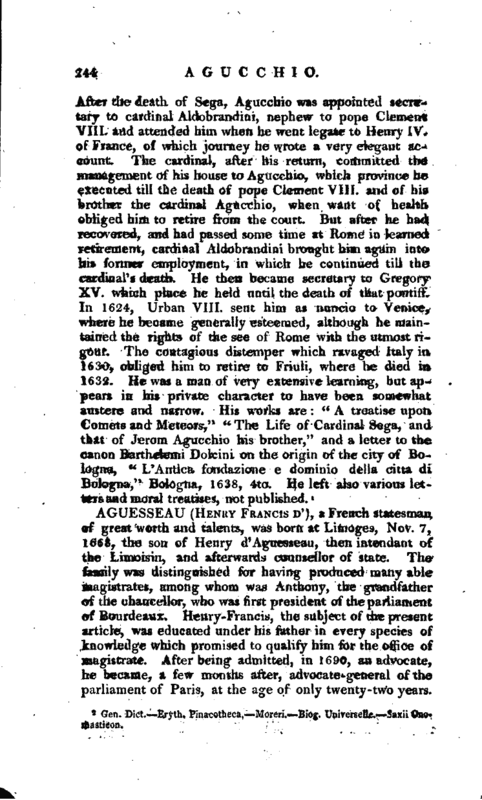 After having performed the functions of his office with reputation equal to his commencement, he became procurator-general; and the nature of his new office furnished him with occasion to display new talents in the public service. In particular, he introduced a complete system of reformation in the management of the hospitals, by which abuses were prevented or corrected; and he restored order and discipline in the tribunals, by which the criminal code was greatly improved. In questions respecting estates, he discovered much acuteness and knowledge of antiquities. Louis XIV. however, died, and for some time during the regency, D‘Aguesseau enjoyed all the credit which his character and virtues merited. In 1717, he succeeded Voisin as chancellor; but before a year expired, the regent took the seals from him, and ordered him into exile for having opposed the establishment of the royal bank, and the other projects contrived by Mr. Law. 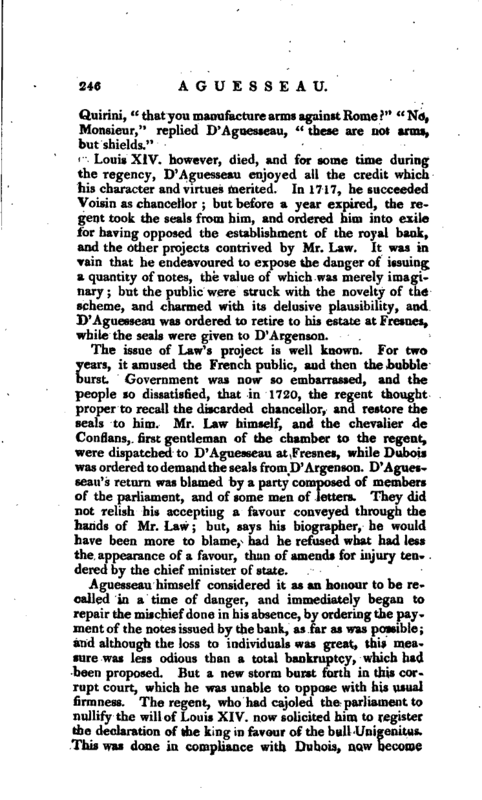 It was in Vain that he endeavoured to expose the danger of issuing a quantity of notes, the value of which was merely imaginary; but the public were struck with the novelty of the scheme, and charmed with its delusive plausibility, and D’Aguesseau wat> ordered to retire to his estate at Fresnes, while the seals were given to D’Argenson. The issue of Law’s project is w<>ll known. For two years, it amused the French public, and then the bubble burst. Government was now so embarrassed, and the people so dissatisfied, that in 1720, the regent thought proper to recall the discarded chancellor, and restore the seals to him. Mr. Law himself, and the chevalier de Conflans, first gentleman of the chamber to the regent, were dispatched to D‘Aguesseau at Fresnes, while Dubois was ordered to demand the seals from D’Argenson. 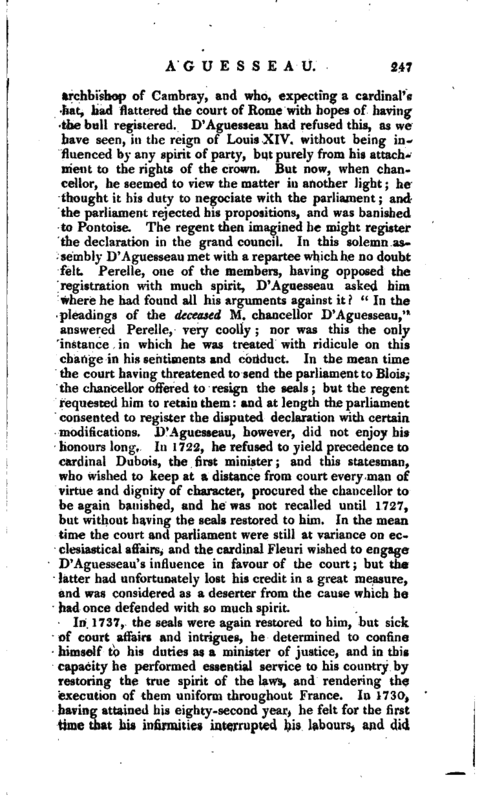 D’Aguesseau’s return was blamed by a party composed of members of the parliament, and of some men of letters. They did not relish his accepting a favour conveyed through the hands of Mr. Law; but, says his biographer, he would have been more to blame, had he refused what had less tke appearance of a favour, than of amends for injury tendered by the chief minister of state. 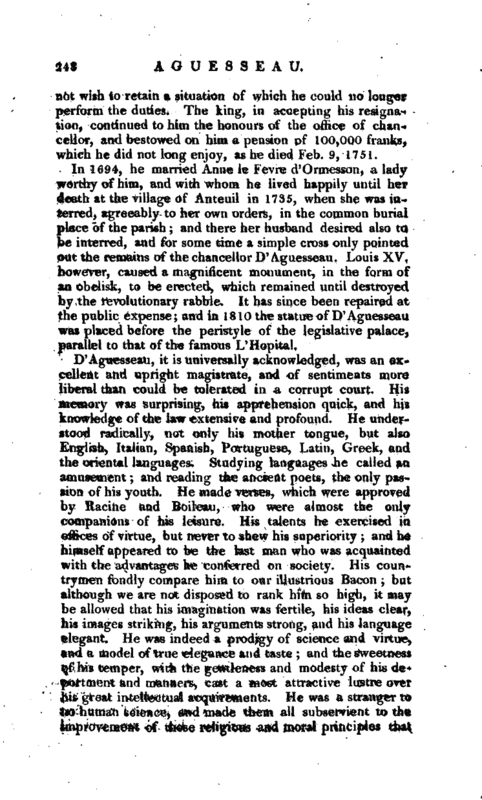 Aguesseau himself considered it as an honour to be recalled in a time of danger, and immediately began to repair the mischief done in his absence, by ordering the payment of the notes issued by the bank, as far as was possible; and although the loss to individuals was great, this measure was less odious than a total bankruptcy, which had been proposed. But a new storm burst forth in this corrupt court, which he was unable to oppose with his usual firmness. The regent, who had cajoled the parliament to nullify the will of Louis XIV. now solicited him to register the declaration of the king in favour of the bull Unigenitus. This was done in compliance with Dubois, now become | archbishop of Cambray, and wfro, expecting a cardinal’s hat, had flattered the court of Rome with hopes of hayiug the bull registered. D‘Aguesseau had refused this, as we have seen, in the reign of Louis XIV. without being influenced by any spirit of party, but purely from his attachment to the rights of the crown. But now, when chancellor, he seemed to view the matter in another light; he thought it his duty tx> negociate with the parliament; and the parliament rejected his propositions, and was banished to Pontoise. The regent then imagiued he might register the declaration in the grand council. In this solemn assembly D’Aguesseau met with a repartee which he no doubt felt. Perelle, one of the members, having opposed the registration with much spirit, D’Aguesseau asked him where he had found all his arguments against it “In the pleadings of the deceased M. chancellor D’Aguesseau,” answered Perelle, very coolly; nor was this the only instance in which he was treated with ridicule on this change in his sentiments and conduct. In the mean time the court having threatened to send the parliament to Blois, the chancellor offered to resign the seals; but the regent requested him to retain them: and at length the parliament consented to register the disputed declaration with certain modifications. 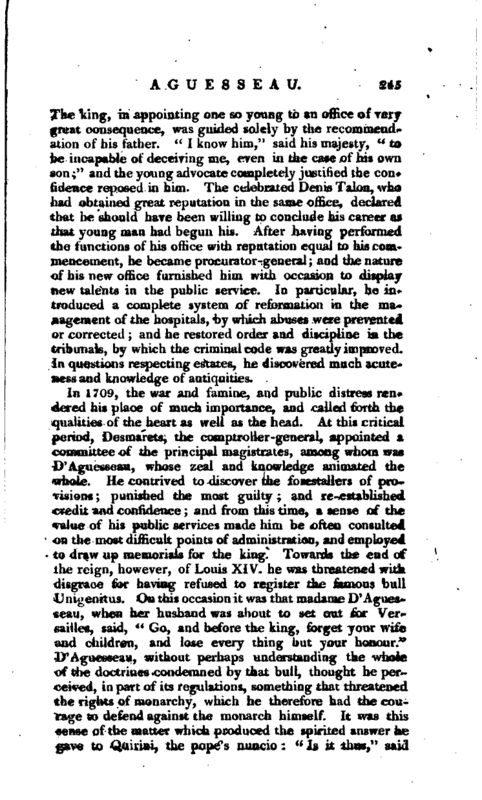 D‘Aguesseau, however, did not enjoy his honours long. In 1722, he refused to yield precedence to cardinal Dubois, the first minister; and this statesman, who wished to keep at a distance from court every man of virtue and dignity of character, procured the chancellor to be again banished, and he was not recalled until 1727, but without having the seals restored to him. In the mean time the court and parliament were still at variance on ecclesiastical affairs, and the cardinal Fleuri wished to engage D’Aguesseau’s influence in favour of the court; but the latter had unfortunately lost his credit in a great measure, and was considered as a deserter from the cause which he Jiad once defended with so much spirit. In 1737, the seals were again restored to him, but sick jof court affairs and intrigues, he determined to confine himself to his duties as a minister of justice, and in this capacity he performed essential service to his country by restoring the true spirit of the laws, and rendering the execution of them uniform throughout France. In 1730, having attained his eighty-second year, he felt for the first time that his infirmities interrupted his labours, and did | not wish to retain a situation of which he could no longer perform the duties. The king, in accepting his resignation, continued to him the honours of the office of chancellor, and bestowed on him a pension of 100,000 franks, which he did not long enjoy, as he died Feb. 9, 1751. In 1694, he married Anne le Fevre d‘Ormesson, a lady worthy of him, and with whom he lived happily until her death at the village of Anteuil in 1735, when she was interred, agreeably to her own orders, in the common burial place of the parish; and there her husband desired also to be interred, and for some time a simple cross only pointed out the remains of the chancellor D’ Aguesseau. Louis XV. however, caused a magnificent monument, in the form of an obelisk, to be erected, which remained until destroyed by the revolutionary rabble. It has since been repaired at the public expense; and in 1810 the statue of D‘ Aguesseau was placed before the peristyle of the legislative, palace, parallel to that of the famous L’Hopital. Biographie Universelle. —Moreri, Suppl.to vol. X. p. 74. —Dict. Hist.orique. Life prefixed to his wgrks. Crit. Rev. vol. VI. 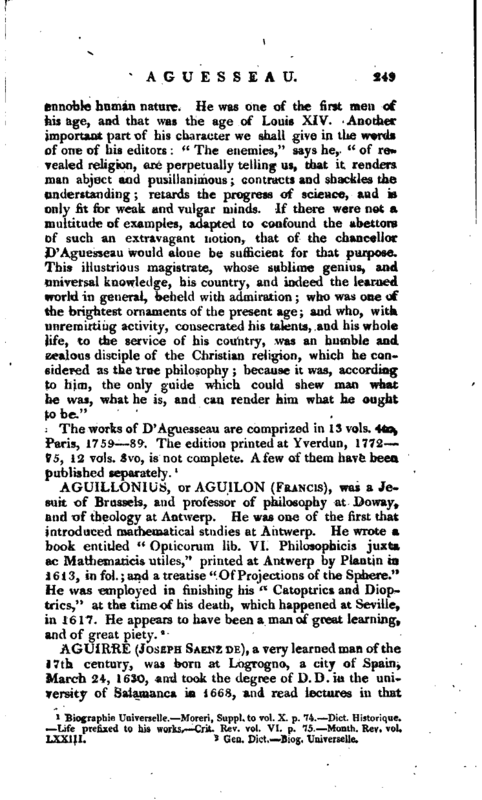 p. 75. Month. Rev. vol. LXXIII.